So cute! And I love the vase… Guess you decided to keep it, good choice. @ kristin YES, i'm sure a crazy lady with a zillion photos of her dog on a blog and a giant neon painting with said dog hanging in her home will do the trick. hahaha! keep me posted! @jessica yes, i selfishly kept it. and i'm so glad i did. i love it! Oh! I LOVE these shelves with all that stuff on them. And I'm in love with the blu vase and, of course, with the Ruca portrait. You styled them up a treat – they look FAB! I have white floating shelves in my office too! Yours look so great. 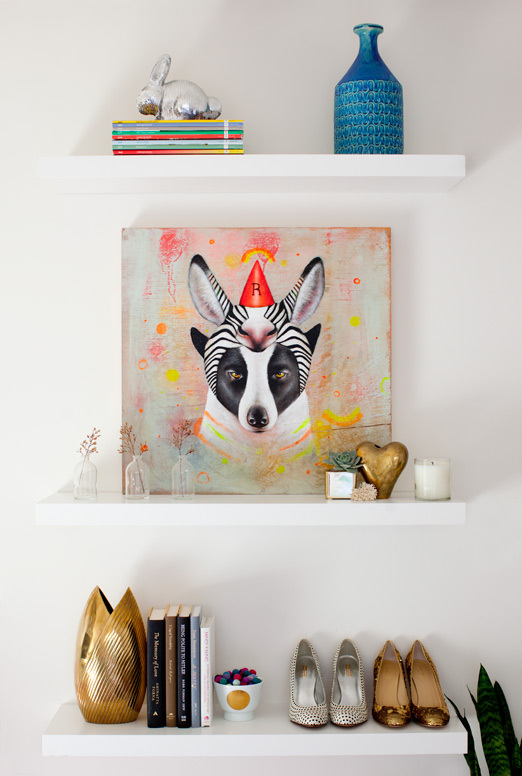 Love the styling and the painting, of course! I'm dying over your gold vase!